There’s some brand new DLC coming for Overcooked 2 it’s called Surf ‘n’ Turf! 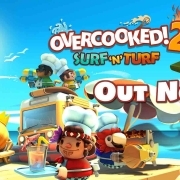 Overcooked 2 Surf ‘n’ Turf is now available digitally on XboxOne, PlayStation 4, PC and Nintendo Switch™ priced at £4.49/€4.99/$5.99. Overcooked 2 is a co-op game that allows 1-4 players to help serve recipes to hungry customers in an series of unconventional kitchens. The game will follow players across kitchens located in hot air balloons, a magical school and even planets! Don’t forget to dodge the fires, collapsing floors or overbearing waiters! Surf ‘n’ Turf will throw players into another adventure with the Onion King. Introducing 12 brand new kitchens. However, in these levels you’ll be at the swimming pool or the beach, to name a couple. With new stages, brings new obstacles, for example, the beach could bring you a tidal wave, therefore keep those food coming before you get wiped out! There are three new chef’s introduced in Overcooked 2’s Surf ‘n’ Turf. The parrot chef, island chef and Boof makes a return, in his holiday shades too! Alongisde new chefs and levels there are two new recipes for players to get tucked into. Fruit smoothies and kebabs! Furthermore, that’s not all! New kitchen equipment is introduced such as the juicer, the bellows and the water pistol! New Levels! Surf ‘n’ Turf features 12 new story levels. Explore the island from the pool to the beach, just watch out for waves and…. conga lines?! So why not, purchase Overcooked 2 by clicking here!